A simple oil painting provided unlikely inspiration for this kitchen redo in Roswell. “It was an old piece of art that I just had to have in the room,” says homeowner and interior designer Anisa Darnell, who collects vintage seascapes and landscapes. Soft nature-inspired colors define the peaceful mountain scene, now hanging above the range, as well as the surrounding kitchen. Classically shaped light fixtures will never go out of style. Pendants are from Cedar & Moss, sconces by Circa Lighting. The ceiling is only eight feet tall, so Darnell created a custom vent hood to give the illusion of height. “I love the contrast of different wood textures and mixing horizontal and vertical lines,” the designer says. Darnell opted for open shelves, which contribute to the casual, cottagey style. Drawer pulls are labeled to indicate what’s inside, a gesture often appreciated by guests. 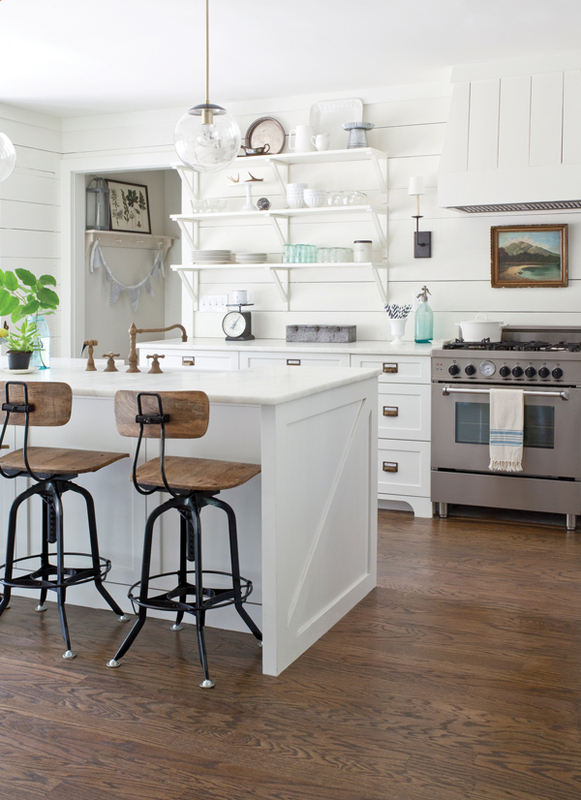 “I wanted the kitchen to be warm, to look like it had always been there,” says Darnell, who chose marble countertops, an antique brass faucet, and a farmhouse sink to add old-fashioned charm. Tip: Darnell kept some of the existing cabinets but hired a cabinetmaker to match new parts to old. Adding “feet” created a custom look and hid the kick plates on lower cabinets.